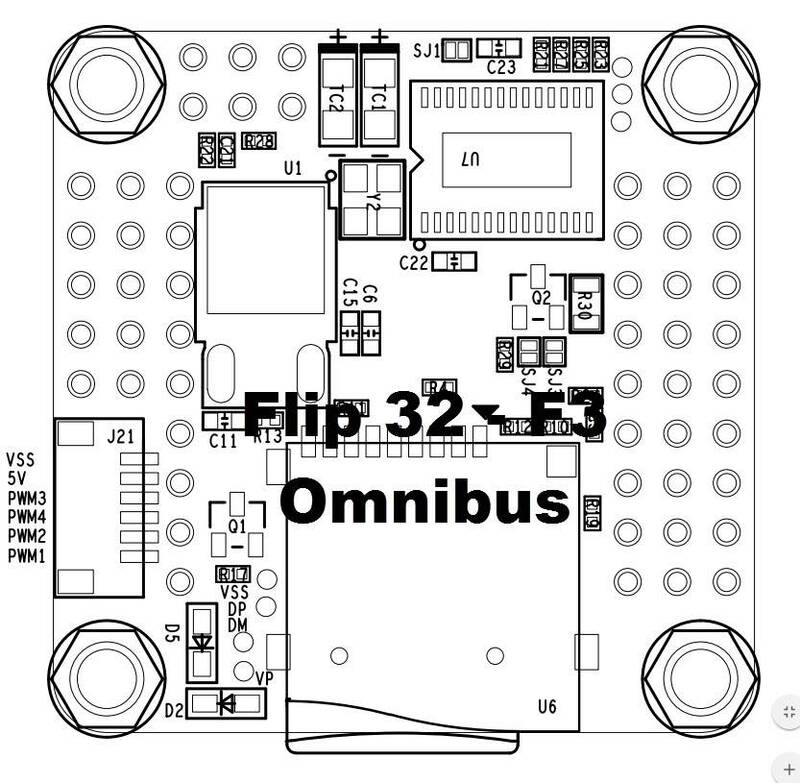 The OMNIBUS F3 V3. Special RTF only v3 with through hold unpoppable USB + other improvements , Now lower price WITHOUT Baro.,with OSD & LDO to be powered with direct lipo. The Omnibus Flight controller line has proven itself to be one of the most reliable, speed, and feature packed boards out today. Setting the standard by which all other flight controllers are done. Leading with way with features like a powerful F3 processor, Betaflight OSD, current sensor, VBatt, 5v 1.5-3A BEC output, MicroSD Black Box, video output filter, and the ability to tune PIDs over video or transmitter, the list keep on growing. Now attempted been to be copied by others, that might not have all the knowledge / customized chips (OSD, 5v). 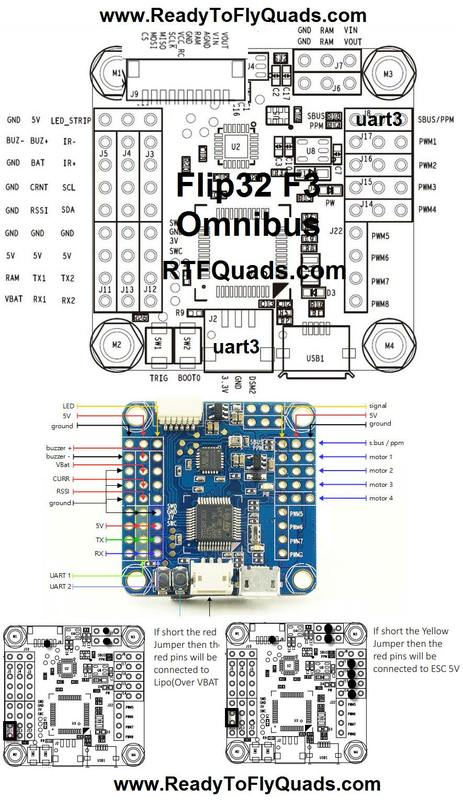 RTFQuads will always have the freshest & newest genuine OMNIBUS total flight controller line up. A portion of the flight controller sales goes toward BetaFlights developers to make sure the firmware keeps growing. Orders are sent with correct updated documentation papers included with the board, special reinforced Golden USB plug and Pin-headers in the bag. Beware of other shops claiming V3 or other ,make sure ours is a best available today, always tested and flashed the the newest firmware. B6 PWM8/SCL OK OK OK I2C must be de-configured? Need furthe testing. B. B07 (PWM7/SDA) works with S.Audio on 3.2, no extra config needed (I2C resources aren't mapped per default). C. Camera Control OSD with work on ANY PWM5-PWM6 using the Camera Control add on board here. 1. Remove the SBUS jumper, leave PPM jumper intact. 2. Connect SBUS signal to PWM6. 3. Connect SmartPort signal to SBUS/PPM. 4. Enter the CLI commands below (they will setup SBUS on UART3 also). ,Now Shipping v2. Pick up the Real Deal. 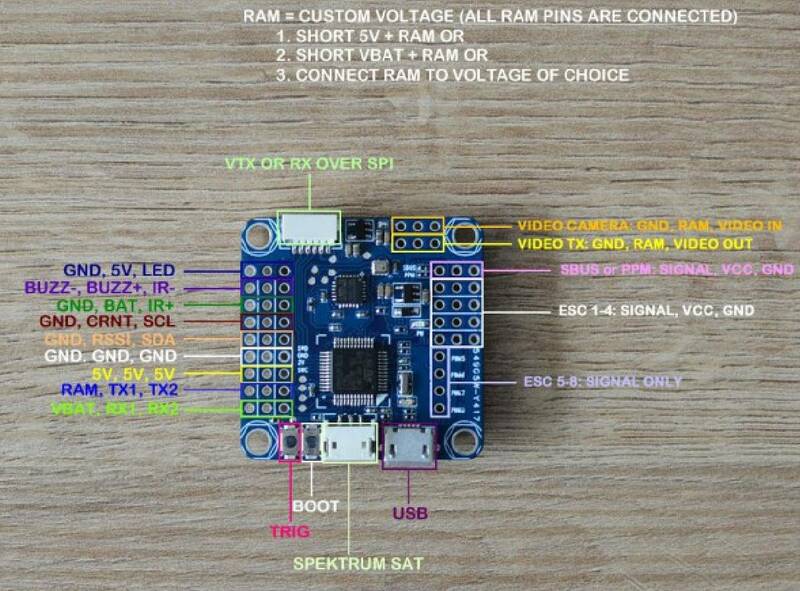 This Flight controller is very proven and now has been tried to be copied by others, but do have access to the custom OSD chip, nor 5v regular parts, and other custom parts . To make sure everyone can get the real deal that will not fail in the air. This flight controller is at cost, and we do give betaflight $5 a board to make sure the firmware keeps growing and growing Video In and out on pin headers and Sh connector for a no solder connection. Golden reinforced stronger USB Plug, Golden Plated though holes, Betaflight 3.0.1 loaded. 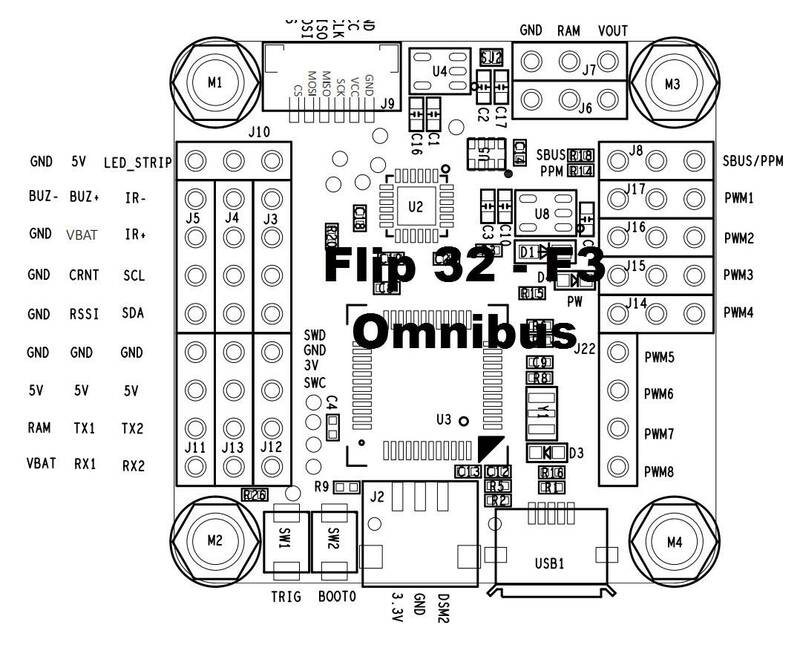 The Flip32 Omnibus flight controller uses the MPU6000 over SPI for the best possible flight performance. 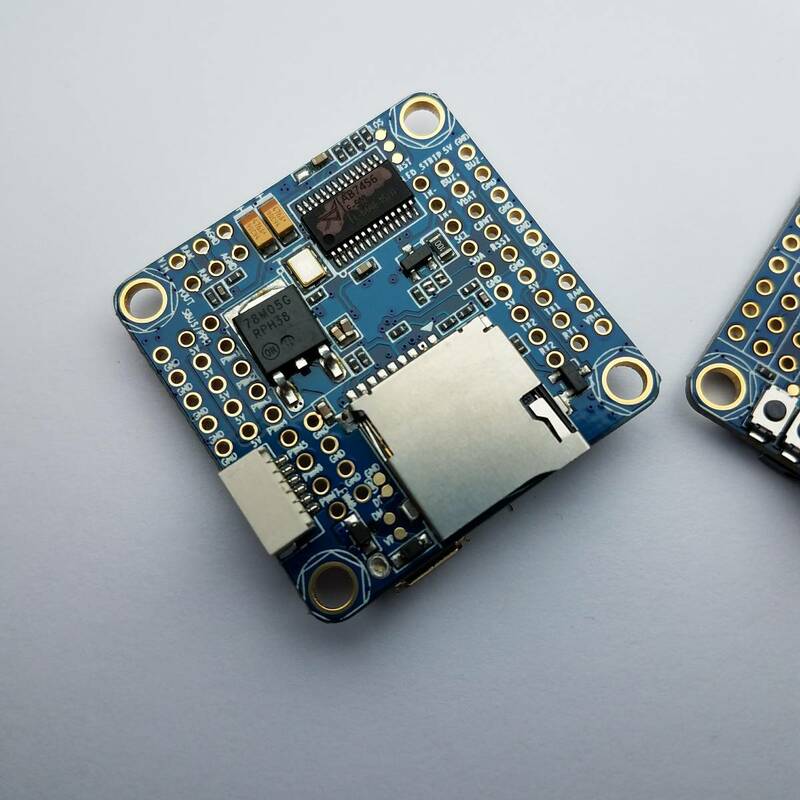 Along with the MPU6000 are a barometer and an AB7456 OSD chip (an upgraded MAX7456) for the BetaFlight integrated OSD. You won't need a PDB with this build because there is a high performance 5v, 1.5a STMicrocontroller L78 voltage regulator, so you can plug the flight battery right into the flight controller.The Flip32 Omnibus flight controller the frist F3 flight controller with a MAX7456 OSD chip directly connected to the flight controller, so it can be configured from the BetaFlight configurator. 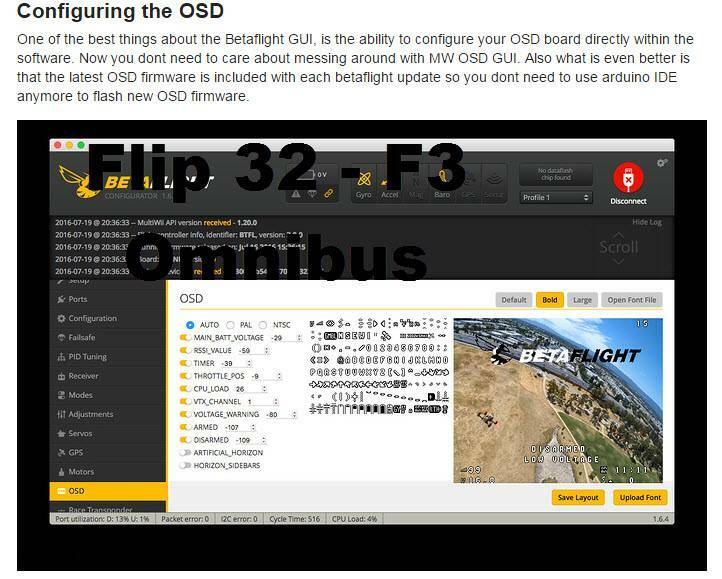 NEW OSD tab in Betaflight configurator lets you setup and configure OSD settings on the fly! 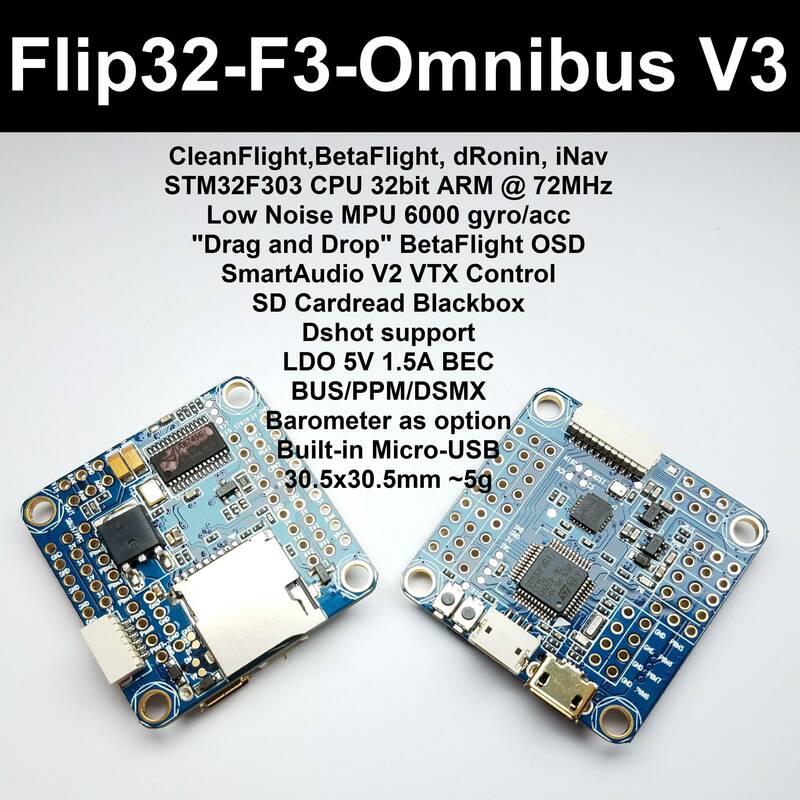 The Flip 32 OmnibusF3 flight controller is an integrated flight controller and OSD specifically designed for ease of use and outstanding flight performance. The MPU6000 inertial motion sensor was chosen for it's high reliability, accuracy and update speed. 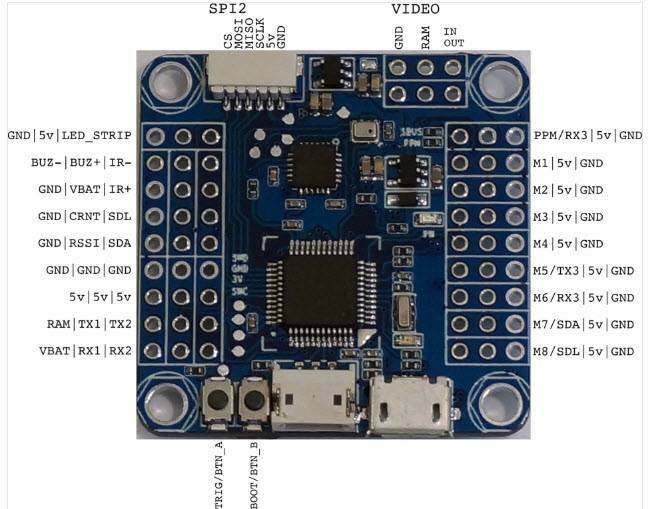 This board has no problem running fast loop times and ESC protocols. There is an onboard barometer for altitude sensing along with an On Screen Display (OSD) chip directly connected to the main processor (MCU). This tight integration between the MCU and the OSD enables fast updates to the display and easy configuration of the OSD, which is managed straight from the BetaFlight configuration tool. You no longer need to worry about the extra hassle of configuring your OSD with a USB/UART adapter and 3rd party configuration tool, it's all built into the flight control software. 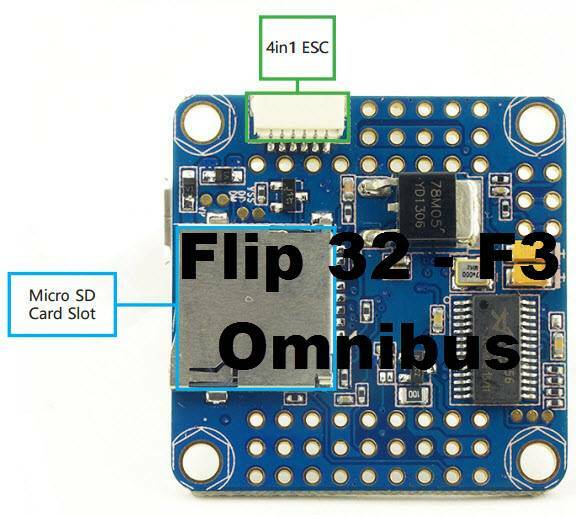 Finally, for maximum ease of use, the Flip 32 OmnibusF3 has an onboard voltage regulator that can easily handle up to a 5s battery. No need to mess with a PDB, just plug your battery straight into the flight controller and you're ready to go! Along with the robustly engineered power management system on the OmnibusF3, special precautions have been taken to ensure that the sensitive OSD chip is well protected, so you don't have to worry about any problems with your OSD. even on 5s! To power the board you have two options. Either connect battery directly to BAT/GND or supply 5V on one of the ESCs connections. However you obviously want to have voltage display in your OSD so just connect BAT/GND to your LiPo (up to 4S). To power your VTX and camera you have even more options. Out of the box RAM is not connected to anything. That leaves you with following alternatives. Short RAM and VBAT to get LiPo voltage. This would be unfiltered and could cause video noise. Short RAM and 5V to get filtered 5V from the board. This would provide clean video but 5V is probably not enought for most VTX on the market. Provide clean voltage from external BEC . It will provide filtered 10V for HS1177 and a VTX. Updated:SBUS/PPM Pin - Pin define changed since Betaflight v3.0 RC5, we use SBUS pin to read PPM input too. This can be changed Via the GUI. These are setup for SBus or PPM pin out of the box. 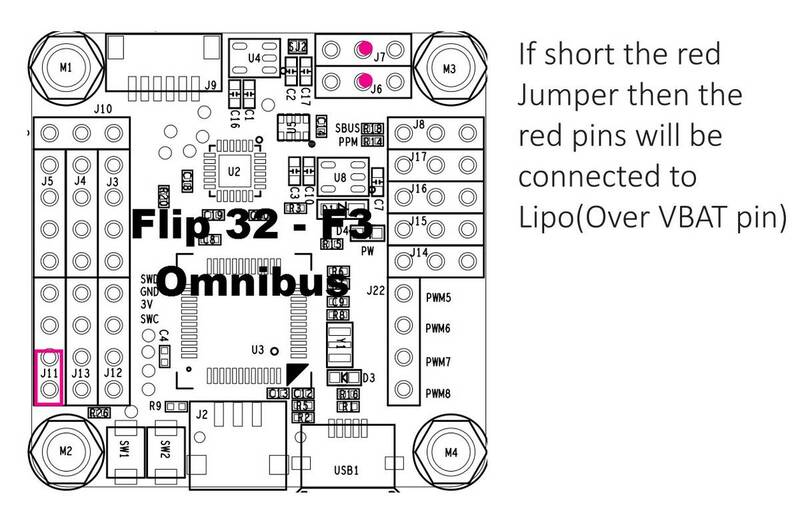 The Flip32 Omnibus flight controller uses the MPU6000 over SPI for the best possible flight performance. Along with the MPU6000 are a barometer and an AB7456 OSD chip (an upgraded MAX7456) for the BetaFlight integrated OSD. You won't need a PDB with this build because there is a high performance 5v, 1.5a STMicrocontroller L78 voltage regulator, so you can plug the flight battery right into the flight controller.The Flip32 Omnibus flight controller the frist F3 flight controller with a MAX7456 OSD chip directly connected to the flight controller, so it can be configured from the BetaFlight configurator. A new generation AIO Flight control for FPV. Based on the F303 MCU and uses F3 MCU controls for OSD over SPI bus in DMA mode. 1.Short RAM and VBAT to get LiPo voltage. This would be unfiltered and could cause video noise. 2. Short RAM and 5V to get filtered 5V from the board. This would provide clean video but 5V is probably enough for most VTX on the market. 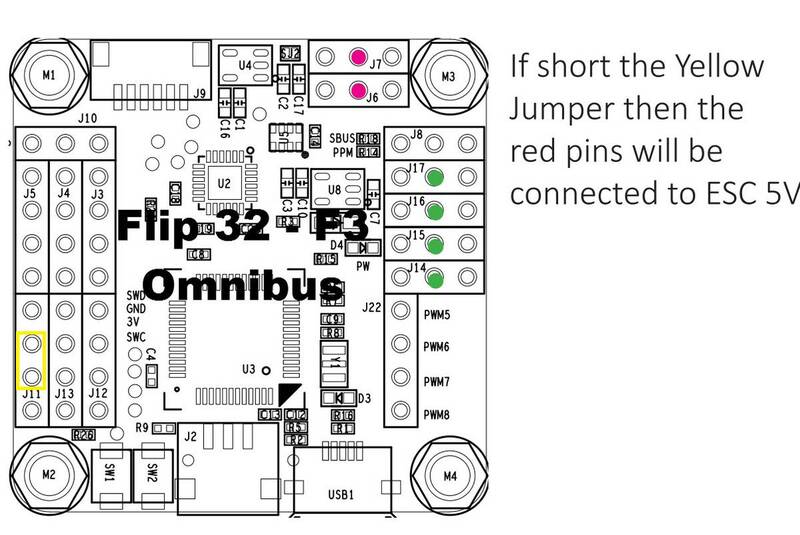 The Omnibus F3 has a 3 position jumper (next to UART1 pins) that is used to select the power source for the board. You can either power it like most other flight controllers, via a 5V supply. Alternatively you can power it directly via your battery supply (up to 4S Lipo only, usualy 12V or 14V). In order to select the Omnibus target within betaflight you might need to select the option to show unstable releases if the omnibus is not shown on the target list for now. And you will also need to flash in DFU mode which is discussed below. This board will be officially supported in Betaflight 3.0.0. Currently it comes with a custom Betaflight version, provided by RTFQ. Use the following releases. To flash the firmware you have to enter the so called DFU mode. On Windows 10 I had to use a tool called Zadig (download and start it) to be able to switch drivers for DFU mode to work. In order to switch drivers you have to take the following steps. Push BOOT button on the flight controller. Plug-in the USB cable (the red LED should not be as bright as normally). Fire up Zadig and hit “Options” and then “List All Devices”. From the list choose “STM32 BOOTLOADER”. Under “Driver” choose “WinUSB” on the right and hit “Reinstall Driver”. Close Zadig, disconnect the flight controller, close all Google Chrome instances. 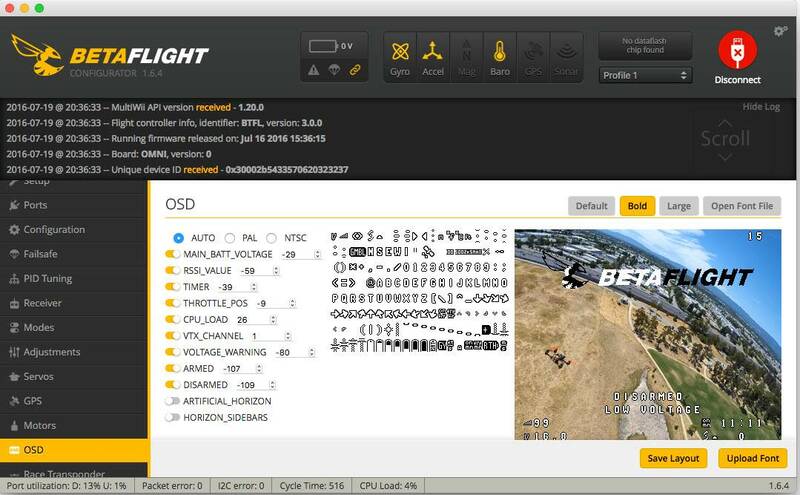 Betaflight now has its own UI so don’t use the Cleanflight configurator anymore. 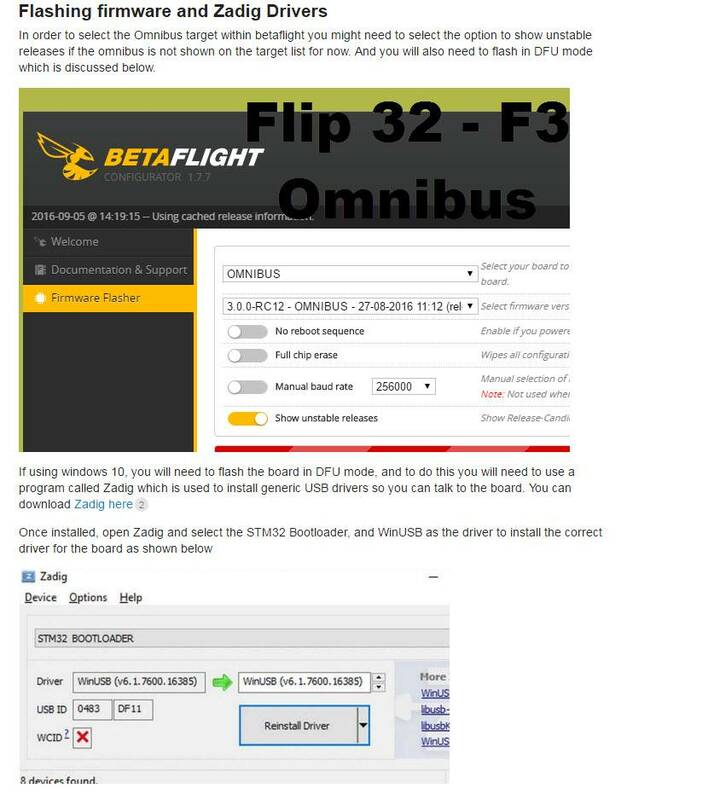 In order to flash Betaflight you have to press the BOOT button and connect the flight controller via USB. You should be able to see “DFU” instead of COM ports in the pull down menu now. The steps to flash a hex file are now straightforward. Watch the Betaflight UI flashing your swifty flight controller. One of the most convenient features of this board is setting up OSD via Betaflight. Just forget about MW OSD or MW OSD GUI. 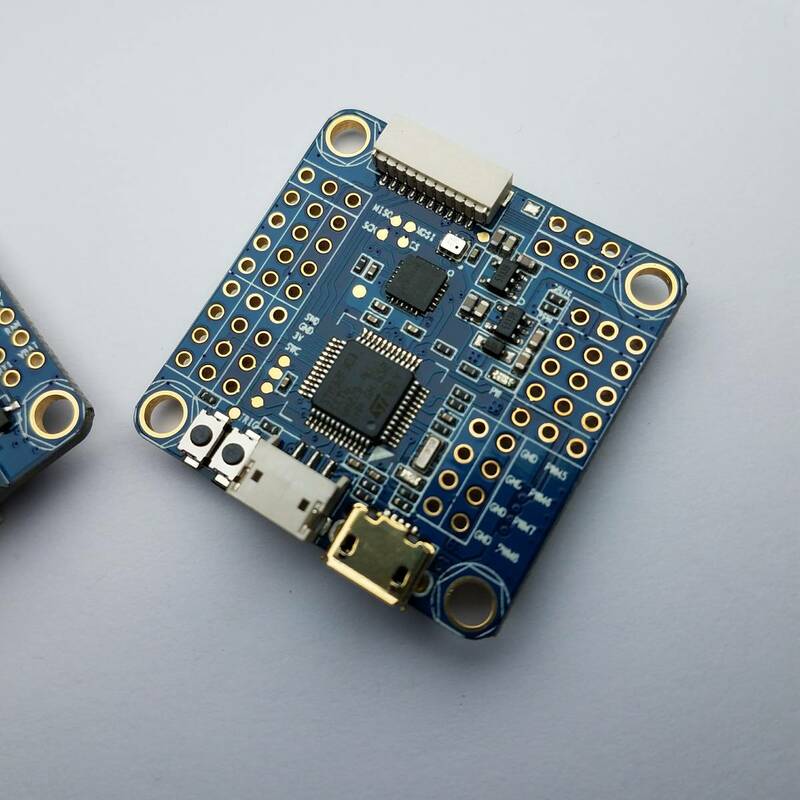 Newest OSD releases will be included in the Betaflight firmware so you don’t have to worry about getting newest ScarabOSD from GitHub and compiling and uploading it with the Arduino development environment to the board. 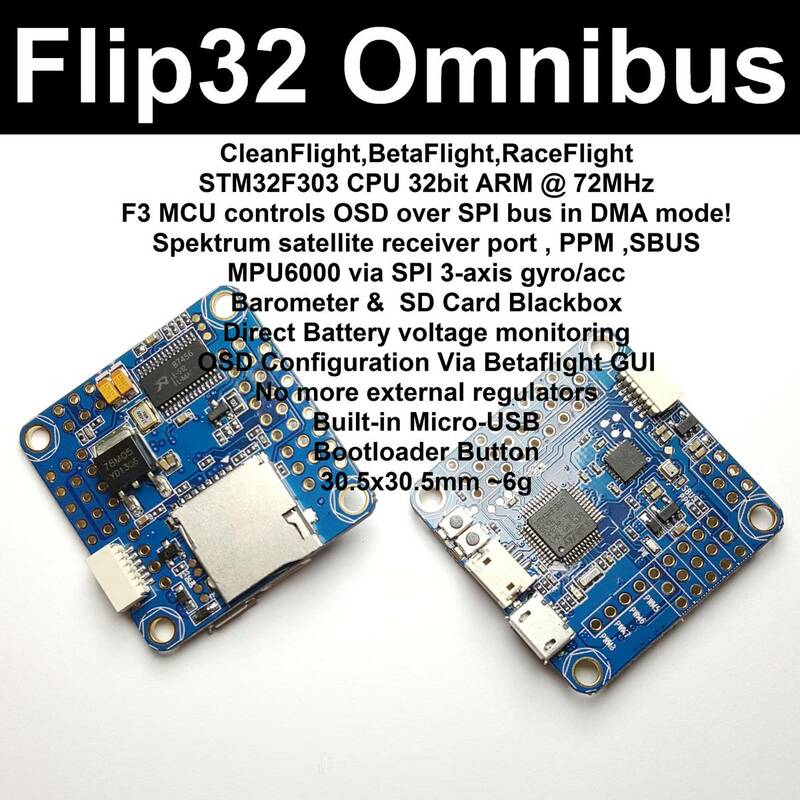 The Omnibus flight controller uses the MPU6000 over SPI for the best possible flight performance. If you haven't already seen it, you should checkout Josh's awesome video on different IMUs. Along with the MPU6000 are a barometer and an AB7456 OSD chip (an upgraded MAX7456) for the BetaFlight integrated OSD. The Omnibus has an SDCard for blackbox logging and uses the much faster VCP USB link, so it takes minutes instead of hours to copy your blackbox logs off the flight controller.